Office of the President of the Senate, Bukola Saraki, has issued the statement below to respond to an exclusive story by PREMIUM TIMES, that Mr Saraki has taken delivery of new cars, worth over N300million. “Senate President, Dr. Abubakar Bukola Saraki has said only his official vehicle, a MercedezBenz, was changed and that the spare car in the convoy is the old one he inherited and has been using since he assumed office June last year. 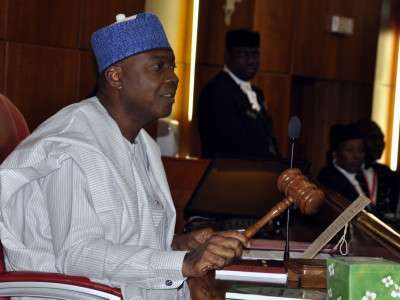 “Reacting to the claim by Premium Times that the Senate President has taken delivery of vehicles worth N330m, Yusuph Olaniyonu, the Special Adviser, stated that it was wrong for Premium Times to classify vehicles provided for security agencies like the police and State Security Service by the National Assembly management for their operations as vehicles bought for the Senate President. “It is an obvious fact that the official and spare cars that the Senate President inherited and has been using are old and have been malfunctioning. There are instances like the day Dr. Saraki visited Keffi for the marriage of the daughter of Senator Abdullahi Adamu and another day at the Presidential wing of the Nnamdi Azikiwe International Airport that the spare vehicle broke down. In both instances, the spare vehicle did not return home with the convoy. The same vehicle had malfunctioned at the Presidential Villa and National Mosque on different occasions. It is for this reason that the Senate President approved that instead of providing two vehicles for him as he is entitled, only one should be bought to replace the official vehicle while the old official car should be converted to spare car. “Also, if the National Assembly Management chose to provide operational vehicles for Security Agencies, should that be presented as if they are personal or official vehicles meant for the use of Dr. Saraki? These are vehicles that cannot be used for other purposes and by other people. The Senate President also have no control over the security vehicles.